Toy Story will always be a special film series to me. I feel in love with it at such a young age that some of my earliest movie memories involved Woody and Buzz Lightyear. One little moment in Toy Story 2 that I always love is the ad for Woody’s Roundup showing the sponsored cereal. As a cereal aficionado, I wish that Cowboy Crunchies existed in real life. This is my version of the fictional cereal to blend two of my passions together. What happens when you mix breakfast cereal and iconic horror movie villains? You get a deliciously evil series of illustrations combining cereal mascots and horror icons. Halloween series 2018. This custom fabric commission was a celebration of the County Bear Jamboree show at various Disney parks around the world. Illustrated as a throwback to the classic picture books of turn-of-the-century America, each portrait highlights a unique character framed on top of a bright green gingham pattern. As a border print, a dress wearer can twirl around and take a virtual tour of each bear! Entering a design contest can have its benefits, even when you don't win! I submitted one of these designs to a contest for the historic Hilton Hawaiian Village on Waikiki Beach. This contest, run by custom fabric printer Spoonflower Inc, was to update the staff uniforms and hotel furniture. I was not voted on as the winner, but my pattern caught the eye of someone at the hotel. They had purchased a sizable amount of fabric and contacted me about wanting to use my pattern for new shirts to be sold at their boutique shop! Always try to achieve for bigger. Someone is always watching. 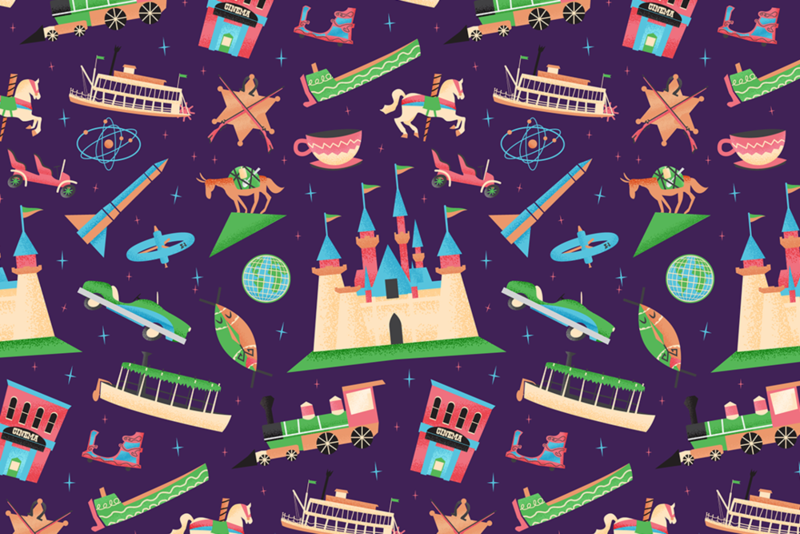 Always influenced by the original magic kingdom in Anaheim, I created these patterns to invoke the old fashion styling of 1950s theme parks. Some of the themes include futuristic, adventure, fantasy, and frontier. Purchase the pattern designs on Spoonflower. Purchase the EST. 1955 tee shirt on TeePublic. Neon and gambling and cowboys, oh my! This vintage Las Vegas pattern shines bright with color and all the sights and sounds of Sin City. In dedication to the victims of the Las Vegas shooting in 2017. Purchase the pattern on Spoonflower. In practicing my combination of typography and illustration, I often think of this quote from the ending of Pixar’s RATATOUILLE. I think it is an important sentiment to show that greatness can come from the most unexpected place. Remy as a character is a true inspiration to me. His passion drives to further my own every day. The 2007 Pixar masterpiece RATATOUILLE has had a profound impact on me personally. The film tells the story of Remy, a common sewer rat with a big dream of becoming a gourmet chef in Paris. With his ghostly mentor, Chef Guestau, guiding him along the way, he learns what it means to sacrifice for your true dream! At its core, it is the story of an artist. Even more so, it celebrates the notion that a great artist can come from anywhere! One piece of graphic brilliance in the movie is the coveted cookbook ANYONE CAN COOK. Since I first saw this film, I have wanted that book (even if only as a prop for display). This is my recreation of that book cover with a vintage texture and feel of something from the mid-century. Two robots in love with a shared goal of preserving the Earth, 800 years into the future! Created to celebrate Earth Day 2018! Spring time is a time for the ponies, derby shoes, and outrageous hats. Created as a submission for the OFF TO THE TRACKS contest for Spoonflower. Grab your favorite tiki cocktail and join in on the adventures of Islanders Trading. Our work is a fun nod to the world of tiki culture and cocktail life. Postcards, shirts, and enamel pins all available. Visit the Islanders Trading shop here. An iconic of Southern California and a gathering place of many tiki enthusiasts, Don The Beachcomber has made its mark on California history. Sadly, the restaurant no longer occupies its original building off of the Pacific Coast Highway in Sunset Beach. Many times in my life, I have driven by the famous "sign of the swordfish" and never went in. Once I finally did in late 2017, I hear that it will no longer be at that location. Only time will tell if it reopens somewhere else. I created this as a tribute to the great Polynesian party house! Growing up, I fondly remember having a stash of birthday or Christmas money to spend on anything at Toys R Us. It was always a special occasion and I was on a mission. Hearing the news of the closure of this iconic chain was heartbreaking. Kids of future generations may never know what it feels like to step into a toy store. This is my tribute to Geoffrey the giraffe. I will always be a Toys R Us kid! Over the past 5 years, I have stuck with the same barber. Each trip is a special experience and Shon Lawhon provides the same quality haircut. Over time, he has moved to start his own shop on the world famous Beach Blvd. in Huntington Beach and I had the privilege of creating the new branding and identity. Taking just a bit of inspiration from the greatness of Jim Flora’s iconic jazz record artwork, the shop carries an old school feel. Family-owned and family friendly. Book your appointment with Shon here! I was commissioned to create an epic border pattern inspired by the classic Disney attraction, the Jungle Cruise. Sketching as many of the iconic scenes as possible, I used a limited color palette with enough contrast to make each scene and animal really pop. The watercolor textures give the pattern even more life. Thanks to Maren for this great project! Celebrating the spirit of adventure and exploration, the brothers over at the Dispatch Co created a series of patches and small gifts for anyone with a need to "live wilder". "We cannot say enough amazing things about Travis! His professionalism and efficient work ethic is far about the rest in this field. He is our go to guy for all of our graphic design needs and advice for our growing business. All the designs that we have worked on together, have sold out in our shop! Travis is truly one of a kind, a wonderful business partner and friend"
When an illustrator and a seamstress are both obsessed with dinosaurs and Disney, great things happen! Working closely with Rex Clothiers, I recreated an iconic poster in my own style blending the old and new. The dinosaur scene is repeated all the way around the skirt and is the perfect outfit for summertime! I cannot describe how much I loved John Krasinski’s 2018 horror film “A QUIET PLACE”. I thought the concept was very unique and filled with tension. The film was translated into a more family friendly version via storybook style with this illustrated scene of a pivotal moment in the film. The greatest front man to ever live. I have a long history with Queen as it was the music of my childhood. From a young age, the sound of Freddie Mercury’s voice was mesmerizing to me. Even though he died at an age when I was much too young to really remember him, his legacy is what makes him the gold standard of singers today. I truly believe that there will be no greater voice than his. He has been gone over 25 years, but this little tribute to him is something I created to show my respect and appreciation. 2018 Oscar Winner for Best Picture! This was a visually stunning movie with a beautiful story and amazing production design. The amphibian man costume is something else entirely! Every year, I take time to watch all of the best picture nominees from the Oscars and create some type of illustrated piece for the winner. This piece also allowed for me to start experimenting with my new brushes and hand-written typography. "Where the birds sing words and the flowers croon!" Illustrated piece created to celebrate the 55th anniversary of Walt Disney's Enchanted Tiki Room at Disneyland. Each of the 4 birds serve as emcee's for the ceremonial show inside the iconic tiki hut. RIP John Glenn, first American astronaut to orbit the Earth and circle it three times. I have a passion for space exploration and the American space program. This moment in history is of such significance that his loss was a huge blow to the world of explorers. This was created as a tribute piece to one of America's greatest space pioneers! What happens when an invader from another planet comes to Earth sipping his favorite cup of java…and has no milk? He goes directly for the source! Educational poster showcasing the size comparison of the various planets in our Milky Way galaxy. This will soon be available to purchase for a small fee by teachers to print for their classrooms! Cover illustration created for the County of Orange annual Accomplishments and Goals publication. The Twilight Zone is one of my favorite television shows of all time. It still has so much cultural relevance today. While this list of illustrations is ever growing, I have created a few tributes to some of my favorite episodes. A proper method for applying cologne in a most effective way, brought to you by the gentlemen of Queer Eye on Netflix. I still find this line from Jonathan Van Ness to be absolutely hilarious. I thought of creating a vintage illustration that invoked a HOW-TO instructional sheet from a classic mens’ magazine. Watch Queer Eye on Netflix now!